Mythbusters Science Fair Book by Samantha Margles. Grades 4-8. Scholastic, January 2011. 128 pages. Review copy provided by publisher. Does cola work as a grease stain remover? Can you power an mp3 player with an onion and a sports drink? Does the five-second rule really work? The team from The Discovery Channel's Mythbusters is here to help kids design experiments to test these myths and many more in Mythbusters Science Fair Book. Ahhhh, science fair season. It starts with an innocent request at the reference desk, "Where are your science project books?" And then another later that afternoon. The next day, three more requests. And before you know it, the 500s are completely depleted and you have kid after kid coming in needing resources on bread mold, photosynthesis, bacteria, and the physics of sports. 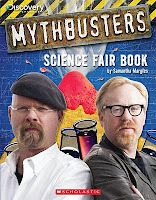 So, how does the Mythbusters Science Fair Book hold up? Its greatest strength is kid appeal. Many a kid drags his or her feet about completing a science project, but perhaps the allure of an interesting TV show is enough to get a kid excited about science. Many of the experiments contained within the book are the same experiments you'll find in dozens of science project books: "Can cola dissolve a human tooth?" "Does talking to your plants really help them grow?" "Make a volcano with baking soda and water." And other "experiments" are just plain weird. "Make a wallet with duct tape"? In what world is that a science fair project? "Can magnets erase the information on your credit cards?" The steps for this "experiment" simply lead to creating your own magnet, not to answering the question in any way. The question is then answered in the small "What happened?" section at the side. But kids might glean some unique ideas here ("Are some items we touch regularly dirtier than a toilet?") and the full-color format and many photographs (including copious appearances of show hosts Jamie Hyneman and Adam Savage and the others) may give fresh appeal to these tired ideas. In my experience (and this is just based on what patrons request of me during science fair season - anyone who's helped a kid with a science fair project recently, feel free to chime in! ), a successful science fair project needs to have enough researchable science involved for a kid to write a decent report. Designing an experiment and testing a hypothesis is one part, but another part is doing research and explaining why you got the results you did. Frankly, this book isn't going to help them with that part. Small "What happened?" sections appear in some of the experiments, but they don't give kids enough information to get a good start on the research they're going to need to do. Where science fairs are concerned, I'd skip this book except where the TV show is popular and might draw in kids who have no interest in science projects. However, though the experiments and activities contained within might not be perfect for school assignments, I would certainly say they will bring hours of entertainment to kids looking for something to do. Hand kids this book and a few 2-liters of cola and they'll be occupied for the rest of the afternoon. This would make a great gift for a kid (or parent) who can't get enough Mythbusters and working together on some of the myths inside would be a great family activity. Happy Nonfiction Monday! Check out this week's roundup at The Miss Rumphius Effect.